Back of the 'Installing & Servicing Melody' DVD. They Might Be Giants is an alternative rock band who debut in 1982. The band was formed by John Flansburgh and John Linnell who originally performed as a sole duo before the inclusion of members Dan Miller, Danny Weinkauf, and Marty Beller. The band, over the years, has done music for children, adults, and television and found success in doing so. In 2009, a promotional DVD was released by They Might Be Giant's management team, The Hornblow Group. 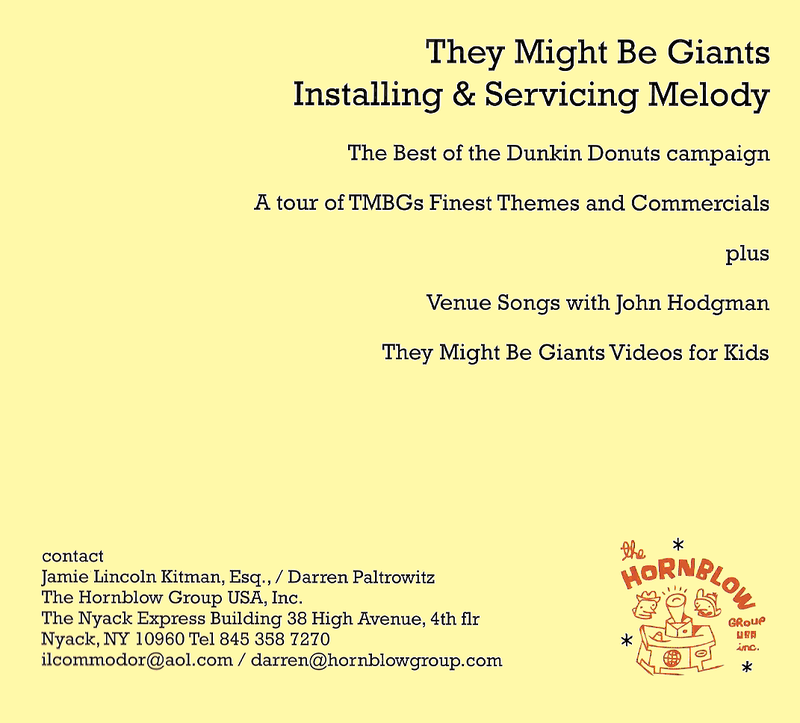 The DVD was titled They Might Be Giants: Installing & Servicing Melody. 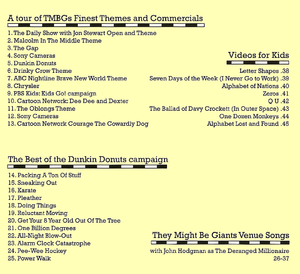 The DVD contained many of They Might Be Giant's compositions for venues, children, television shows, and commercials with the accompanying video. The DVD seemed to have had a limited release and few collectors seem to own it. Much of the material on the DVD is already online, however, not in the best quality. Only one of the contents in high quality have been ripped from the DVD, that being Cartoon Network's Dee Dee & Dexter video. However, their composition for the Sony Cameras commercials seems to be lost and only on that DVD. Inside of the DVD case, track list. "Dee Dee & Dexter" video ripped from the DVD, uploaded by youtube user Peter.